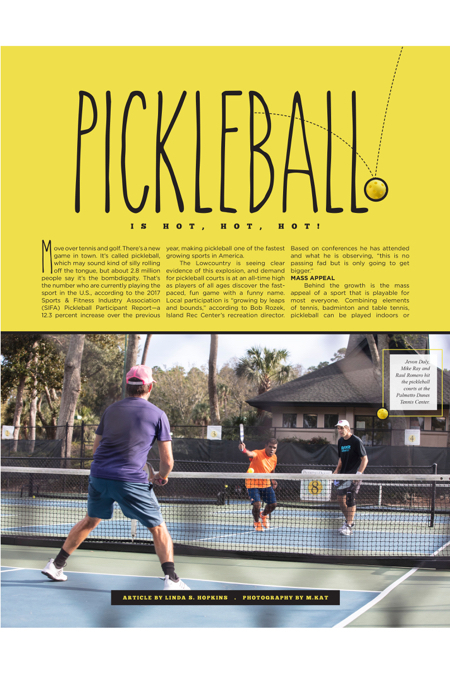 Hilton Head Magazines: CH2/CB2: Pickleball is Hot, Hot, Hot! Move over tennis and golf. There’s a new game in town. It’s called pickleball, which may sound kind of silly rolling off the tongue, but about 2.8 million people say it’s the bombdiggity. That’s the number who are currently playing the sport in the U.S., according to the 2017 Sports & Fitness Industry Association (SIFA) Pickleball Participant Report—a 12.3 percent increase over the previous year, making pickleball one of the fastest growing sports in America. Behind the growth is the mass appeal of a sport that is playable for most everyone. Combining elements of tennis, badminton and table tennis, pickleball can be played indoors or outdoors, as singles or doubles, using a modified tennis net, a paddle, and a ball that is similar to a whiffle ball but a bit sturdier and more durable. The badminton-sized court is shorter than a tennis court, which attracts older players who can still compete without having to run too far, local enthusiast Bob Soltys explained. But don’t get the notion this is the new shuffleboard. Pickleball is a fast game that attracts elite athletes as well as kids, who are naturally quick and agile. But if you are less mobile or just want to play for fun, it’s the perfect opportunity to socialize and get your blood flowing. Soltys sees pickleball not only as a popular sport for area residents, but as a potential new revenue stream for the island. “This is a sport that is not going away, and people will pay to play. There are economic and lifestyle benefits,” he said, suggesting that Hilton Head Island can become a pickleball destination—just like it is for tennis, golf, biking and the beach. With the growing popularity of the sport, one of the greatest challenges for area players is finding enough courts and divvying up court time. “We’re trying to make it a public activity. We don’t want it to be exclusive. We want everyone to have the opportunity to play,” Soltys said. To that end, he is an outspoken advocate for the Hilton Head Island Pickleball Club, whose overall objective is to create a centralized larger pickleball complex. “This blends well with a similar recreation initiative that the Greater Island Council and others are lobbying the town to create. We have piggybacked on that initiative to request the inclusion of pickleball,” he said. To date, the town has invested in three ways: by supporting the Island Rec Center’s programs as a whole, by resurfacing existing courts at Adrianna (Hilton Head Park), and by funding and supporting the creation of four more courts at Chaplin Park (basketball courts now converted to multi-use courts). But many more courts are needed to keep pace with the rising interest in the sport, Soltys said. As of now, the Island Rec Center is the primary public facility for pickleball on the island and a good place to meet and get matched up with players of similar level. Starting in January, they will also be offering beginner and intermediate classes with a certified instructor. Private clubs are also embracing the pickleball craze, some with dedicated courts, certified teaching professionals, and burgeoning pickleball programs. All public courts are multipurpose, with permanent lines painted for pickleball in addition to basketball (Rec Center & Chaplin) or tennis (Adrianna). Dedicated play times exist. Courts are managed and maintained jointly by the Hilton Head Island Pickleball Club and Island Rec Center. $3/day or $40/year (pay at the Island Rec front desk). Playing inside the Island Rec Center carries an additional fee not covered by yearly membership. To learn more about public playing opportunities, visit the Island Rec Center at https://islandreccenter.org or call (843) 681-7273. For more information or to join the Hilton Head Island Pickleball Club, visit www. hhipbc.com. Residents and guests of these private communities can contact their respective clubs for information on court availability, instructional programs, organized activities, and more. Pickleball History: What’s in a name? Although seemingly still in its infancy, pickleball has been around for over 50 years. It was invented in 1965 on Bainbridge Island, near Seattle, by three dads, Joel Pritchard, Bill Bell, and Barney McCallum, who were desperately seeking an activity to entertain their restless children while on summer vacation. As a member of the HHI club for the past four years every statement made in this article is true to the core.